The retroviewer allows you to directly view the sample at the port. You see what the instrument sees. The retroviewer consists of a lamp within the sphere to illuminate the sample and a motorized mirror inserted into the optical path behind the collection lens to re-direct the imaged sample onto a mirror for viewing. The retroviewer lamp is a small tungsten halogen lamp located on the left inside of the sphere. Its purpose is to illuminate the sphere to allow the user to view and align a sample at the reflectance or transmission port. This is especially useful if the area of the sample just barely covers the port. 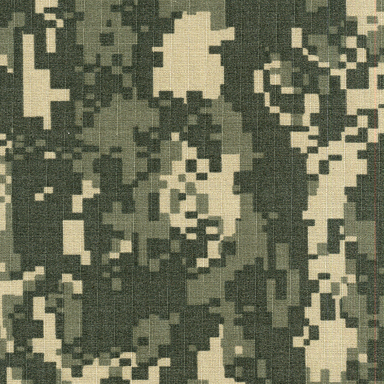 Typical sample were individual colors can be isolated for color measurement using the retroviewer. On sphere instruments, the retroviewer mirror is found on the left side of the just behind the transmission compartment. Beside it is an activation button built into the left edge of the case that activates the retroviewer lamp. In the software manual, there is a description of two modes of operation for the retroviewer lamp. 1 – The lamp stays on between readings (“Lamp Stay On” or continuous mode). 2 – The lamp remains off after each reading (“Lamp Stay Off” or manual mode). Selecting the Lamp Stay On or continuous mode is done by pressing the retroviewer button longer than 1 second until a beep is heard. Selecting the Lamp Stay Off or manual mode is done by pressing the retroviewer button briefly (less than 1 second) which will turn on the retroviewer lamp just for that one time. Either mode remains active until the other mode is selected. To switch back to the Lamp Stay Off or manual mode when the lamp is on, press the retroviewer button briefly to turn the lamp off, then again to turn the lamp on, then again to turn the lamp off. The retroviewer lamp will now stay off (is now in Lamp Stay Off or manual mode) between readings. The retroviewer lamp turns off during the time that a measurement is taken using the pulsed xenon lamp. The retroviewer lamp does not affect the instrument measurements. No matter which mode is chosen, the lamp will turn off after 4 minutes of inactivity to conserve lamp life. The instrument ships in “Lamp Stay Off” or manual mode as default. FAQ: “On the USPRO when my customer switch OFF the retro viewer lamp, one of the indicator light blinks for about 8 seconds. During these 8 seconds the customer can not make a measurement which is a problem for them when they are making an averaged measurement and need to switch OFF the light between each measurement. The operation that you describe sounds normal. The retro-viewer switch turns on a tungsten light in the sphere to illuminate the reflectance port. The retro-viewer mirror views the reflectance port through the LAV lens. 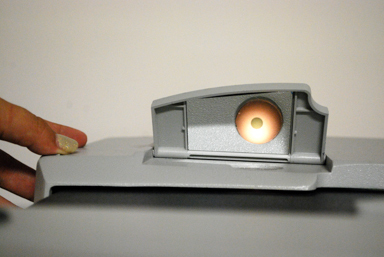 The retro-view of the port plate is used to center the sample to be measured. If one of the smaller areas of view (MAV – medium area of view; SAV – Small Area of View), the retro-viewer light must be turned off and the smaller area of view lens moved into position (may take 8 seconds) . When complete, the SAV LED light will blink indicating the lens is moving into position; become solid when ready; then the measurement is taken. If the retro-viewer light is turned on again, the smaller area of view lens will have to swing out of the optical path. The retroviewer lamp can be set up for Continuous or Always On mode (instructions below) rather than Manual. This might make the process faster. The retroviewer is most often used to align opaque samples at the reflectance port that are size limited. However, the optical path for reflectance and transmission is the same, and the retroviewer looks directly through the lens seeing a 17 mm diameter area of view for the optical path through the transmission compartment through the sphere to the reflectance port. You should be able to align or center transparent samples using the retroviewer but would view a larger area of view than the MAV (Medium Area of View) or SAV (Small Area of View) on the USPRO. Ambient lighting may be affecting your viewing. Make sure that you close the transmission door to view the transparent sample using the back lighting of the retroviewer lamp.